National Portrait Gallery Director Andrew Sayers is the first to admit that this year, in its third instalment, the National Photographic Portrait Prize (NPPP) has really come into its own. Art prizes can take a few years to hit their stride, and now, as interest and profile has increased, the entries into the NPPP have, quite accordingly, exploded in quality. The annual exhibition receives plenty of National attention, not in the least because it comes hand in hand with one of the most generous cash prizes in the country. A whopping great $25,000 is the award up for grabs, courtesy of an ongoing sponsorship from VISA. Portrait prizes, and particularly photographic ones, will always get a running start in the popularity stakes, because we are all naturally obsessed with images of other people. A predisposition to voyeurism means that audiences soak up these images with unbridled enthusiasm, regardless of who the subjects are and the reasons for having their portraits taken. This year’s exhibition of NPPP finalists looks to be more popular than ever. What in previous years has been a hit and miss, at times cliché heavy affair is now a consistent and surprisingly revealing exhibition, relentless in its emotional intensity. Curator Christopher Chapman believes many of this year’s finalists ‘evoke moments of defining self realisation and powerful self awareness’, and upon seeing the show it’s easy to see how he’s drawn this conclusion. Many of the selected works exude either a vulnerability, a defiance or an intriguing mix of both. In stark contrast to the largely forgettable fare in the 2009 exhibition, some images are so striking I find them difficult to shake from my mind even days later. 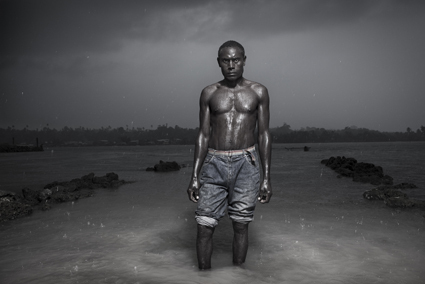 One of these is the commanding, goose-bump inducing Gori, Bougainville by Stuart Miller, the subject staring down the camera as he stands in the ocean under a blackened, storm torn sky. Softer but no less powerful is James, Nicole Marie’s sensitive and understated portrait of a dedicated Dungeons and Dragons player. Simultaneously gritty and ethereal, her sitters face is bathed in an otherworldly computer-screen glow. Unlike other more established portraiture prizes there is refreshingly little in the way of celebrity here. Even in works that do portray well known faces, including entertainment personalities Chris Lilley, Paul Capsis and Julia Zemiro, we are treated to a far less guarded and manufactured view (Zemiro nearly unrecognisable). These few familiar faces aside, the exhibition acts as a survey of a more realistic Australia, as the forty three finalists neatly sidestep portraiture stereotypes and the tendency of these occasions to try and depict a nation of heroes (the Aussie battler, the sporting superstar). Instead this is a salon of people living quietly and otherwise unnoticed, going about their business, and caught up in the banality of everyday life. A waitress takes a moment’s break in a downtown Melbourne café, while a migrant family poses proudly in front of their red brick suburban home. Two sisters sunbathe unceremoniously in their backyard, and a young man at boarding school shaves, bathed in golden morning light. Many of the subjects are caught up in difficult circumstances, but the resulting portraits remain dignified and honest, rather than romanticising or overly politicising their situations. Perhaps the most poignant of these, and certainly the closest to home, is the cuttingly titled Master chef by Canberra’s own Andrew Sheargold. The portrait illustrates the reality of life for award-winning apprentice chef John Campbell, forced to live at government housing facility Havelock House in the face of the rental crisis – a world away from the glamorous existence portrayed by dozens of food-focussed reality TV shows. Not only are the sitters from all walks of life, but the artists themselves are too. The winner of this year’s prize is Scott Bycroft, a high-school art teacher from Perth and self-taught photographer who has only been experimenting with the medium for a few years. His striking black and white portrait Zareth captures one of the students from the school with what the NPPP judges recognised as an ‘immediacy and power’. As with many of the subjects in this year’s collection of finalists Zareth regards the camera with an intense, almost unnerving gaze. Moments like these occur throughout the exhibition – a testament not only to the power of photography to capture these definitive snatches of time, but also to the keen eye of the artist behind the lens. It is, after all, the artist who seeks out these split second instances, managing to capture the essence of a personality and identity in a single image. Now, as it comes of age, the National Photographic Portrait Prize is finally succeeding to deliver on the core aims of the National Portrait Gallery: ‘to increase the understanding of the Australian people – their identity, history, creativity and culture – through portraiture.’ By creating portraits of the people around them both amateur and professional photographers across the country are taking control of this understanding.